You need to make a purchase but the options are overwhelming. Do you buy the new coat that is within your budget but made by an ethically questionable brand? Or do you choose the eco-friendly option that is much more expensive? Making choices that suit your lifestyle and match your budget is tricky and fraught with pitfalls. Whether you're adopting a minimalist approach to your style with a capsule wardrobe, an environmentalist vegan wanting to make the best decision for the planet and the animals, or trying to reduce your waste with a low impact habits, knowing what “the right” decision is can be a challenge. Making considered purchases relies on a process of selection and evaluation that is consistent with your beliefs, enabling you to uphold the principles by which you live your life. A lot of factors may influence your decision making process, some more important than others. Things like the urgency of the purchase, environmental impact, sustainable practices (or lack of), waste production, budget, and whether they are cruelty-free and vegan-friendly or not. Making a considered purchase means weighing these factors up and deciding on what you consider to be the best purchase. Very rarely can we make perfect choices, it often involves an element of compromise. Some of your principles will be utterly non-negotiable while you might find yourself more flexible about others, it's about picking our battles. What really matters is we're trying to make the best decision we can with the options we have. This is my decision-making process for making considered purchases, yours might be different. We all approach our choices from different perspectives and so long as we're all doing our best to limit the impact our decisions have, there's no wrong or right answers. Some purchases are 'need-to-have' and others are 'nice-to-have'. Certain items are necessary purchases that need to be made sooner than others, making them a priority. Whenever I want or need to make a purchase, I mentally put these items in a hierarchy focusing on the 'need-to-have' purchases before considering the 'nice-to-have' ones. This process allows me to monitor and control my spending, helping me to avoid impulse purchases and wasted money. Urgency is always the first thing I consider before even looking at the options. Being vegan is a non-negotiable for me; everything I buy must be vegan and cruelty-free, no exceptions. There's often a clash of interests with the low waste lifestyle since a lot of zero wasters are happy to purchase non-vegan items, like beeswax wraps, if it means opting for a low or zero waste option. Personally, if something isn't cruelty-free, I'm not interested. In most circumstances there is always a cruelty-free option available and if there isn't, I'm fine to go without. There really is no reason for anyone to buy products tested on animals or made from their skin and fur when there are plenty of alternatives available. Whenever I'm looking for something to buy, whether it's clothes or home goods, I try to source it secondhand before buying new. It's not always possible to find what I need or convenient to wait until the right thing comes along though. Certain items I'm able to wait for, like clothes, but other things like specific pieces of furniture can be more urgent. Not owning a car means collection-only items from online sellers is trickier than shopping at local secondhand or vintage furniture shops, and home decor is important to me, so tracking down the right piece can be frustrating. I'm far more likely to successfully buy secondhand clothing and small home goods than furniture but I also check first before buying new. If I cannot find what I'm looking for secondhand, my next option is to buy new and two things that are equally important when making my decision is: sustainability and low waste. I don't buy from fast fashion brands, however, I'm more flexible with this than I am veganism. Although it's very rare I would step inside a high street store to buy clothing, I don't rule it out as a very last final resort for essentials. Any time I'm shopping for something new, I thoroughly investigate a brand's sustainability and ethical policy. I want to make sure I'm giving my money to a company that respects their workers and the environment by treating them fairly and paying them a living wage. I have a go-to list of brands I've already vetted, which helps make shopping a whole lot easier. The best way to reduce waste when making purchases is to make less of them. Finding low waste options for clothing and personal care items is relatively easy. When it comes to furniture, other than buying secondhand, low waste options are quite limited; you're often severely restricted in options. That's why low waste comes quite far down in my list of priorities, I try to sidestep waste through limiting my purchases overall and buying secondhand whenever I can. If I have to resort to buying new items, I try to limit waste as much as possible by requesting companies deliver their products in recyclable packaging and I reuse any packaging I get as best I can. Price doesn't comes so low in my decision-making process because I have an unlimited budget but rather because I live a frugal life and I'm happy to go without if I consider something to be too expensive. 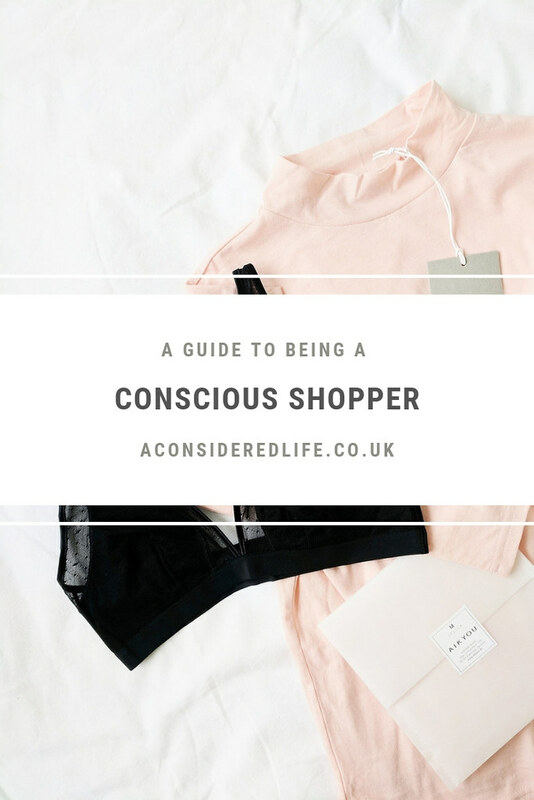 After seeking out cruelty-free, second hand or low waste options, I then compare these items based on price, which ultimately sways my purchasing decision. Whether something is worth the money it costs is subjective and ultimately depends on how much I need an item and whether I can justify the cost of it. Price comes last in my decision-making process because somethings are worth their price tag, regardless of how much that costs. If you find purchasing decisions difficult but want to make more considered choices, think about your own principles and let them guide you. List all the things you consider before making a purchase and how important they are to you when making a final decision. Always keep these factors in mind when considering future purchases, and you'll find yourself making better choices about how and where you shop, and what you buy. What do you consider before making a purchase? Let's talk about it in the comments.